Before you become a pro rider, many riders hope to make the "big dance" known as Loretta Lynn's! Loretta Lynns is a motocross facility in Tennessee that hosts one of the biggest races of the year. Riders who qualify, come from all over the country including places like NY, CT, TX and more. To get here riders must attend a regional qualifier to prove themselves against other riders. Once completed riders can then move on to the "big dance." Some riders will make it, others will not, however, the experience is worth the trip as they have said. As few riders from the New York area who make the usual pilgrimage to Royal Mountain Ski Area for Central New York events include Jeremy Edwards, Mark Molesky, Paige Weingarten, and Gavin Betts. These riders will compete in 35 categories of classes ranging from schoolboy, college-boy, 250 novice, minis and others just to name a few. Riders will get a day to practice. Practice will begin on July 30th and racing will take place starting on July 31st. Due to the large amount of riders, classes are spread out over the course of a week with racing ending on August 4th. During the weeks' events, riders can attend special events like a chapel service in the morning, attend autograph signings and more. The experience alone is one of the great things you must have for your bucket list if you are a rider. To those who quailified, we wish you the best of luck. Have fun an be safe! On Sunday July 29th, Royal Mountain Ski Area will host it's final CNYMRA (Central New York Motocross Racing Association) of 2018. The first two double headers brought lots of exciting bar to bar racing action. The Saturday of Memorial Day weekend brought Sunshine and clear skis and the Sunday brought us rain and muddy bogs. 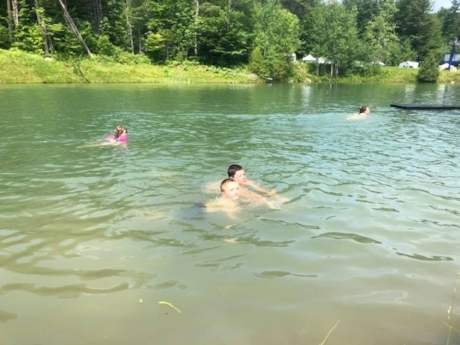 Moving on to July 4th weekend, riders returned for another weekend of fun in the sun; however, Mother Nature played her role in making the day quite warm. Heat and humidity would plague the atmosphere and make conditions extremely uncomfortable for riders but they toughed it out and we saw some awesome racing in many of the classes across the board. After weeks of rain, riders return to Royal Mountain Ski Area for one more shot at the hill. Some riders coming to redeem themselves; others coming to prove themselves. As always, shout out to our friends and supporters Rockauto.com. Rockauto helps us out with giving us the wristbands as you arrive at the gate. They are a great support to Royal Mountain! Who will be on the podium this weekend? Who will get the hardware? Monster Motocross/ CNYMRA Motocross takes off Sunday! You won't want to miss the action as riders from all over Central, New York duke it out up the hill to the first turn. Paul T. Peterson calls will call the action high atop race central! You can listen to the broadcast on 88.1 on the ole F.M. dial. Admission is $10 at the gate, Sign-up is from 7-9am. New to the sport? CNYMRA has classes for all skill levels; Kids, teens, adults and more. We also host bikes and quads at the races. So come one, come all have some fun and check out the action. Only 13 races remain on the CNYMRA schedule in 2018. If you haven't gotten to one yet, you still have plenty of time! Monster Motocross successful during heat wave part 1! Thank you Rock Auto for the wristbands! Thank you for your years on continued support! So it was just like any other race weekend. 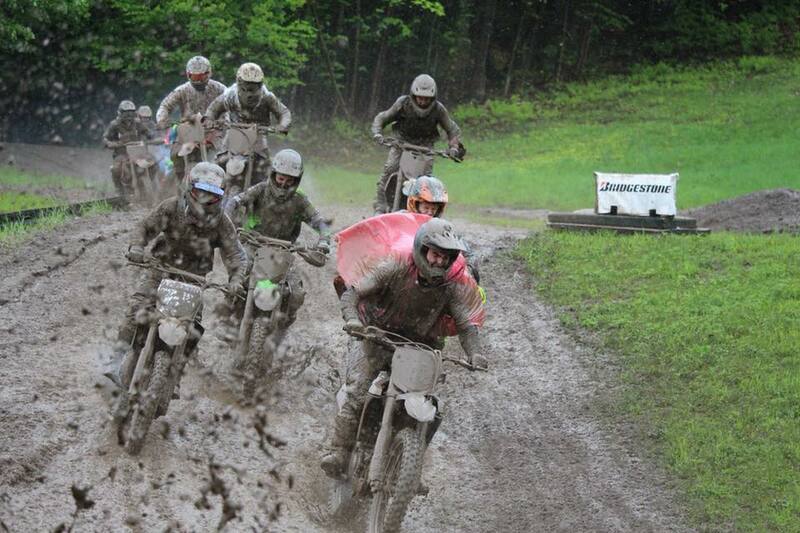 Campers began pulling into Royal Mountain for the next round of CNYMRA/ Monster Motocross on Friday evening. We grabbed our wristbands compliments of RockAuto.com. Royal Mountain and Rock Auto have had a great working relationship for many years. Anyway, we all sat and enjoyed the evening and the sunset by the fire; some folks found themselves swimming in the pond due to the heat. Before we knew it, our beds were calling our names. We woke up the next day to a warm one. Riders grabbed lots of water to bring to and from the track. Practice got underway as usual and then we went racing. Some riders would take off where they left of at Echo Valley Mx the weekend before. Maxx Miller shot out of a canon once again flying past the competition in both of its 50 open and 50 pee-wee Sr classes for the win. In the mix for the novice class, riders such as Carter Petersen would do battle with Skyler Shute and Cody Kramer. Kramer at open point was a savage doing anything and I mean anything to get passed the competition. After an awesome charge at Echo Valley Mx, Kramer was hungry to get on top of the box. Kramer was doing all he could battling hard with Skyler Shute. Shute would close the gap between he and Petersen but couldn't quite make the lines work. Hard fought race in the novice class, Petersen would take the win! Shute and Kramer would have to settle for 2nd and 3rd. In the mini class, out of the hole-shot into the first corner up the hill, its the orange KTM machine of Revin' Evan Miller along with the swarm of other riders. It would be Miller, Zelich, and the rest of the class. Joe Edwards on the 911 machine was able to get close to Miller but couldn't quiet make the pass. Next up in our quad classes. This is no ordinary quad group; there are some fast riders in these classes. With the momentum from Echo Valley Mx and the last weeks supercross race here at Royal you could tell there was going to be some fierce action on the track. First out of the gate was the 921 of Alissa Duncan and the 119 of Kaylee Ross duking it out up the hill. Ross would hold the lead until Duncan would hit the turbo booster and zoomed by Ross. Man shot out of a canon and she is out of there. Duncan would take the win, Ross however would have to settle for 4th after two other competitors Nathaniel Kadic and Rian Hynes would get by to take the position away. Experts, experts experts. The plus 25 class is certain were these got heated, no pun intended of course. Brian Falzo, Caleb Schachtler, Sam Schilde, Sam Spinella, Johnstown's own Adryan Pelosi could be seeing racing bar to bar. At one point in the day, riders of this class were seen with bars and wheels touching and it was starting to get dicey. Falzo would take the win and Schilde would take the runner up position and Schachtler would take the last spot on the podium. There was so much great racing and fun had by all! All riders survived the heat and our pond became a very busy place! For more results about your favorite rider, look in our local paper the Leader-heard! Follow the link below. Riders cooling off in the Pond after a hot day of racing. At the end of day one of racing, racers retired to their pit areas to rest their heads. On other parts of the track, fire works were like bombs burstin' in the air celebrating the July 4th holiday. Spectators watched in awe as the spectacle of the celebration began. As the evening grew on, some folks off in the distance noticed the moon being a very bloody red color. The big red moon lit up the sky like nothing anyone had ever seen before. The strawberry moon takes place every June during the phases of the moons cycle. It's quite the change to see during a weekend! Strawberry Moon seen over Royal Mountain Saturday Evening! 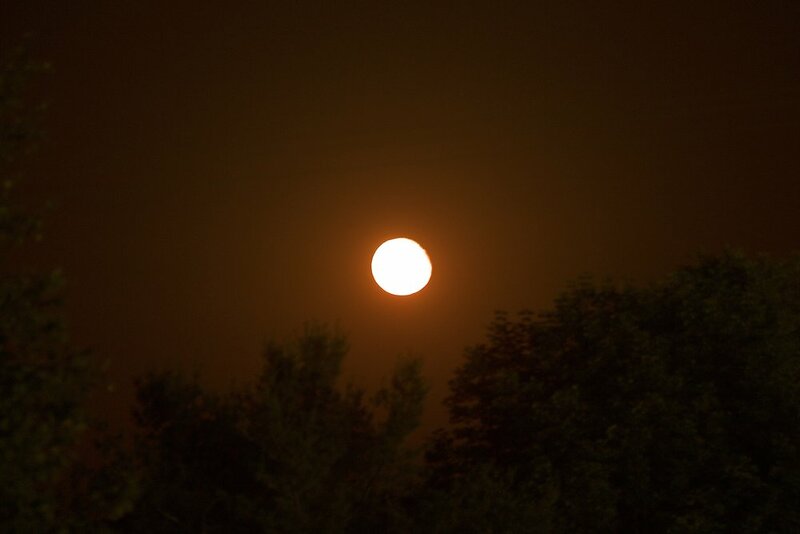 The Strawberry Moon—a North American nickname for June's full moon—owes its fruit-inspired moniker to the Algonquin tribes of Native Americans, as it appears at the time of year when they would harvest strawberries. In other parts of the world, it is also known as the Honey Moon, Hot Moon and Full Rose Moon. Scott Salls (807) and Billy Shafer (816) in a hard battle for position during last years July 2nd race here at Royal Mountain! 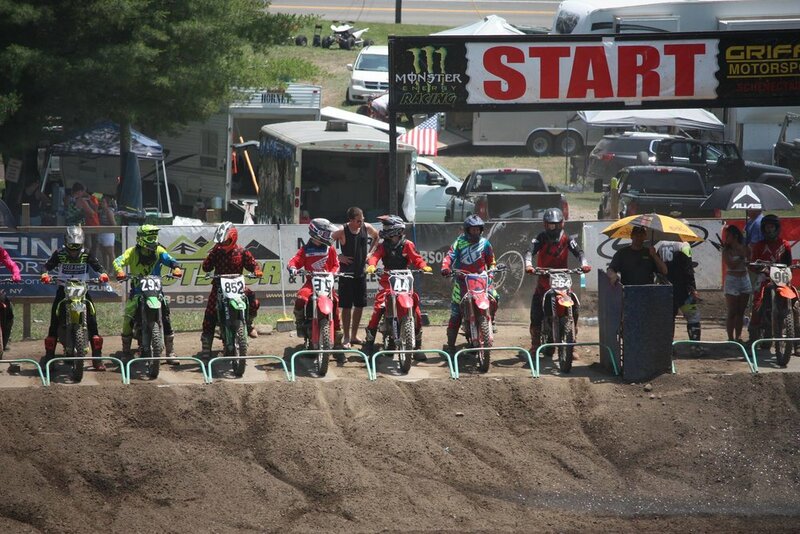 For many years now, CNYMRA (Central New York Motocross Association) has held a double header race weekend on the 4th of July (could be before or after, depending on how the 4th falls). 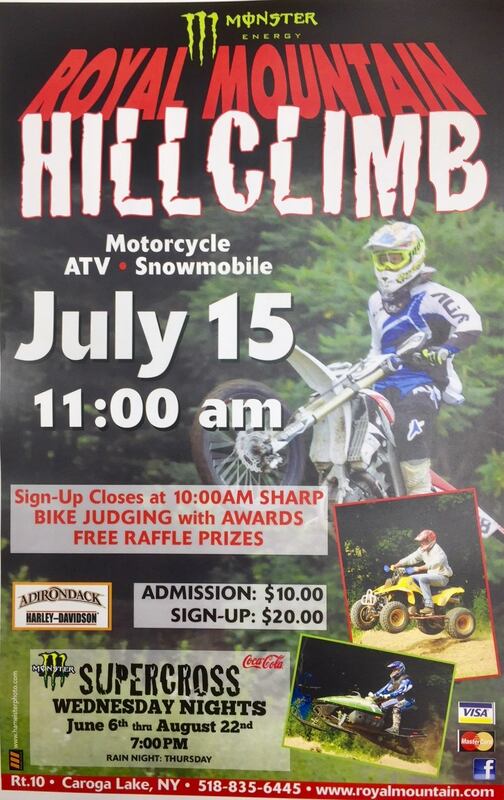 Riders from all over New York State or other areas to come tame the mountain. Many are quite successful. With camping available Friday evening through the weekend it's a popular place to go for a quick get away. And of course on the hot summer day, you can be taking a cool, and refreshing dip in the pond! It's an awesome way to cool off after a hot day of racing I tell you! The scenery and property are also awe inspiring and the property is very much like a campground, just with out the electric and water hook ups. So if you are looking for something to do this weekend, come on out for some bar to bar racing. We have riding skills for all levels, from beginner to experts. Check out our venders on venders row, Pop's Pop will be there with all the ice cream and cold treats along with the exclusive vender for CNYMRA RPM's appeal, even Sanders Motorsports from right here in Johnstown will be here. Looking to wake up on a good note? Make sure to head up to the lodge, grab a freshly made cup of coffee from the girls. Grab a freshly made Belgian waffle and make sure to start your day off right with a well balanced breakfast. Then, pull up a chair, sit back, relax and watch the best riders on CNYMRA circut duke it out for position on the track. We look forward to seeing everyone there this weekend! We are expecting a large turnout this weekend; so come one, come all! Kawasaki riders Todd Kinne (39) and Mike Ward (171) battle going into the big triple section on the back side of the ski resort! Good evening Riders! Thank you to everyone that came out last night! We had some awesome and exciting racing. One of the best places for racing under the lights during the summer! It was a beautiful night for racing with clear sky's and comfortable temperatures. Moving on to racing. We had some awesome bar to bar, exciting side by side racing. If you weren't here, you most certainly missed out. Moto 1 out of the gate and of course it's the mini bikes 50cc. Local riders "Moto" Maxx Miller would fly out of the gate like a cannon. Moving on to the quads. 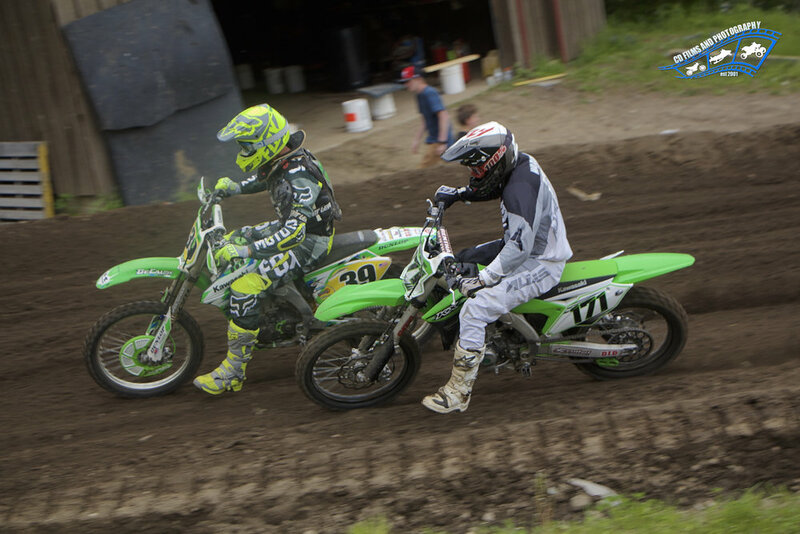 We had some awesome racing between expert rider Anthony Pennacchia and amateur rider Peter John Miller. Both riders would thread the needle multiple times around the track evening bumping bars and tires in the big bull turn behind the finish line. It definitely got exciting in this class since Miller would be returning to quad racing for the first time after recovering from an injury and Pennacchia would return to racing after a small time away. Miller and Pennacchia would take the over all wins for their respective classes. Notables in the 125 2 stroke classes were Fonda Rider Carter Petersen and Oriskany Falls rider Codi Russell, along with Deegan Thrasher who would stick his front fender into the top 3 to round out the podium. Later on in the schoolboy 12-16 class more action among the top 3 of Tyler Blowers, Carter Petersen, and Codi Russell would go at it. They would round out the top 3. for the class. Series regular Connor Cross would return to take the top spot in the Quad novice class but had some fierce competition with Matt Mitchell nipping at his heals for the 2nd place spot on the podium. Finally to the last moto of the evening, Carter Petersen and Bryce Mussenwould be duking it out on the track in the 250 novice class. Never count out the #6 machine of Peter Marrate who manages to sneak for a tight 3rd place position finish after a good hard fought battle with Mussen and Matt Campbell and rider Ryan Tietz. To round out the post we'd like to welcome back lengendary rider on the number #42 Honda, Bobby Kinary (who was spotted in the leader harold newspaper this Morning) ripping up the track and putting on quite the show for our spectators. Again, Thank you all who came out last night. We look forward to seeing you next Wednesday followed by our Cnymra D3 Motocross event next Saturday and Sunday. Also make sure to check out Echo Valley Mx this will be hosting this weekend CNY race on Sunday. Enjoy the weekend all, we will see you all next Wednesday! Link to the article in this mornings paper; the Leader Herald can be found here.